"In September 2016, our happy and thriving 4 month old baby boy was diagnosed with a brain tumour. Thankfully for us Isaac's brain tumour was a low grade non-spreadable tumour, but due to it's size and placement it was classed as inoperable. Our only option was 12 cycles (months) of chemotherapy. The tumour was causing Isaac to have hydrocephalus, which meant his body was not draining the brain fluid as it should be. He had a shunt inserted into his brain to drain this excess fluid. What was meant to be a simple operation, then head home for Isaac have all of his treatment as an outpatient didn't go as planned. 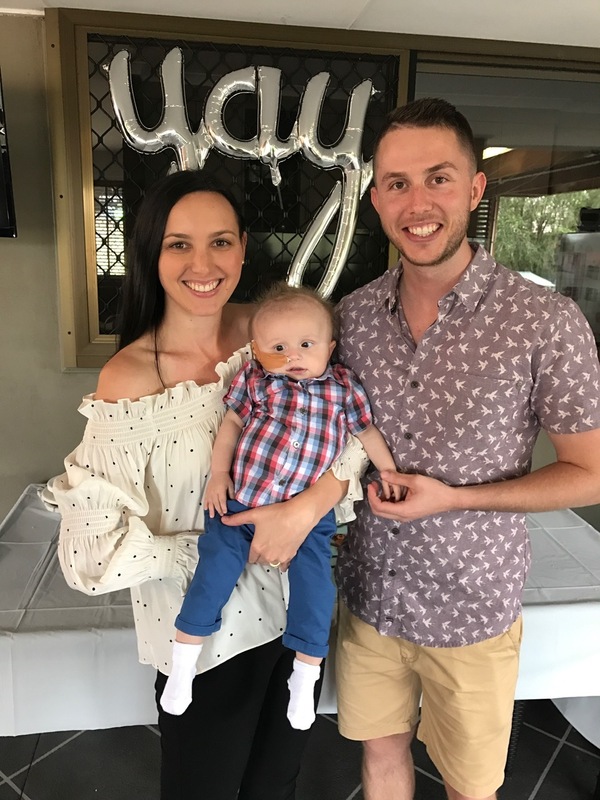 Isaac spent the next four months in hospital and the oncology ward at Lady Cilento Children's Hospital became our second home. Isaac had multiple brain operations to get a shunt working properly and because of the constant brain operations, there was blood floating around in his brain fluid. With so much pressure built-up our happy, energetic thriving little boy was no more. Isaac became practically lifeless and he lost the ability to do so much. During this time he spent all up nearly 2 weeks in PICU (Pediatric Intensive Care Unit). In December 2016 our beautiful boy finally turned a corner. No more operations, he was putting on weight, he was doing more and more and was so much happier. In January 2017, he was finally well enough to come home. Isaac still has monthly chemotherapy and fortnightly blood tests but thankfully we haven't had an overnight hospital stay since February 2017. He still has a long road ahead with meeting other milestones but seeing where he is now compared to last year is amazing. His tumour has shrunk and we continue to pray that within a few months when we are due to finish treatment, it is gone once and for all."